Can My Cat Eat That? What People Foods are Safe for Cats? Let’s face it, cats are adorably manipulative. 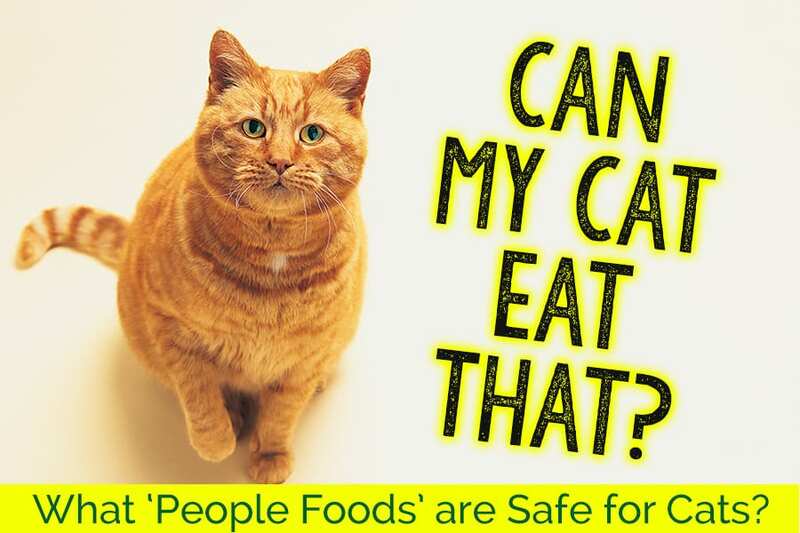 From time to time, we become powerless against their sad eyes and hungry meows, and just can’t resist giving them a treat of ‘people food.’ But, before you give in to your feline friend’s demands, be sure you know which foods are purr-fectly safe and which can do more harm than good. Canned fish contains protein and Omega 3 fatty acids that are vital for your cat’s health, but keep portions small. Raw meat – including raw bones! – are not only safe for your cat, but offer a number of health benefits. 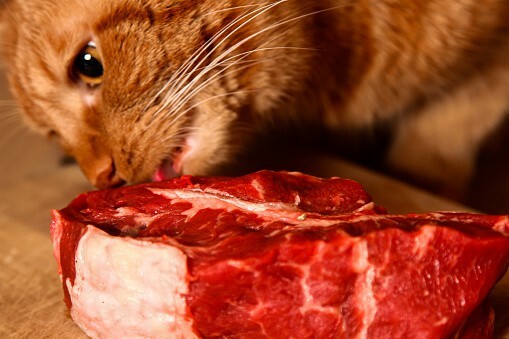 Chewing raw meat and bones keeps a cat’s jaws strong, teeth clean, and gums healthy. The moisture in raw meat promotes a healthy urinary tract. In fact, many cats – especially those in the wild – thrive on a raw meat diet! That said, it’s important that your cat gets the proper amounts of meat, organs, and bones to ensure he or she is getting a complete and balanced diet. And, always supervise your cat while he’s eating raw bones. 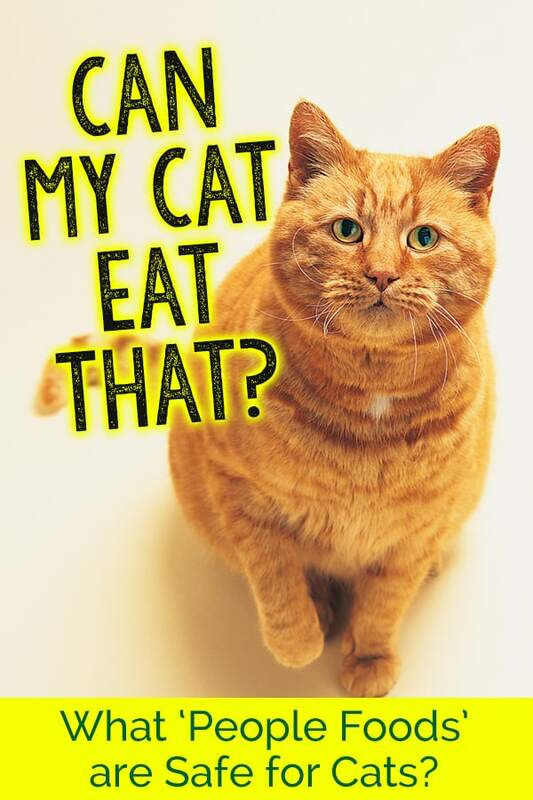 If you’d like to learn more about feeding your cat a raw diet, check out one of these books. Never, ever, feed cooked bones to your cat! Once cooked, bones can splinter more easily, leading to sharp pieces that are very dangerous for your cat’s intestines. No chicken bone is worth a trip to the ER! 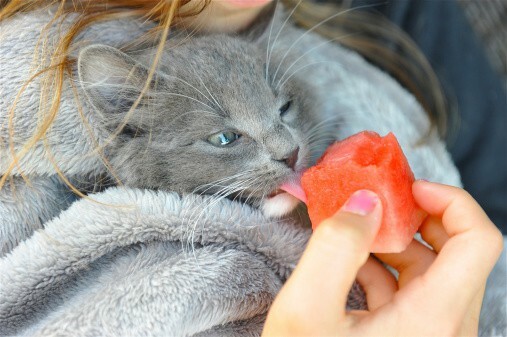 As weird as that seems, some cats enjoy watermelon, and it is safe for them to eat. Melon will satisfy your cat’s desire to chew on plants. Fed as an occasional treat, melon can help with some digestive issues. It contains Vitamins A, C, and Potassium. Only give your cat deli meat, like ham, salami, and turkey slices, as a treat – and keep those portions small. Most deli meat contains nitrite, harmful preservatives, added flavorings, sugar, and a lot of sodium. You’re much better off tossing a bite-sized piece of raw chicken or steak to your feline friend! Liver can be a very healthy treat (and one of my cats’ favorites!) but too much of it can cause Vitamin A toxicity – a potentially fatal condition. Liver is good for cats. In fact, cats on a raw diet require a certain percentage of liver in their diets. But – feed with caution. Chocolate contains methylxanthines, theobromine, and caffeine. These toxins cause arrhythmia, tremors, seizure, and death. The darker the chocolate, the higher level of toxins it contains. So, never, ever feed chocolate to your cat! They don’t have the receptors to taste sweets anyway, so you may as well save the delicious chocolates for yourself! Cats love milk, but their digestive systems aren’t so keen. Many cats are actually lactose intolerant! So that saucer of cow’s milk may have your cat running to the litter box with diarrhea and an upset stomach. 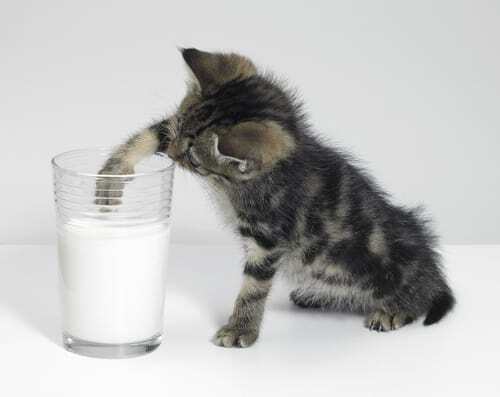 If you insist of giving kitty some milk, try raw goat’s milk instead. It has a lower level of lactose, and raw milk includes the enzymes to help your furry friend digest it. Feed in moderation, if your cat tolerates it. Ah, the incredible, edible egg – nature’s perfect food. Eggs are a great source of protein, and their shells are a fantastic source of calcium. 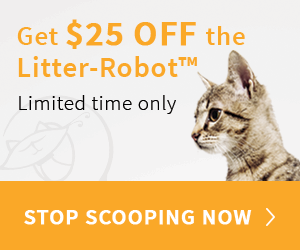 Yes – kitties can eat the shells, too! You can serve your cat an egg hardboiled, scrambled, or crack a raw egg over her food. Grind up the shells and serve those, too! There is some debate as to whether eggs are safe if fed separated from their yolks. While the debate continues, just feed the entire egg to your cat and feed in moderation. Researchers don’t even know why, but there’s something in grapes (and their wrinkly, dried version, raisins) that can cause acute kidney failure in cats and dogs within 48 hours. Do not ever feed grapes or raisins or anything containing grapes or raisins to your feline friend. In fact, if you suspect your cat has ingested them, contact your vet immediately. 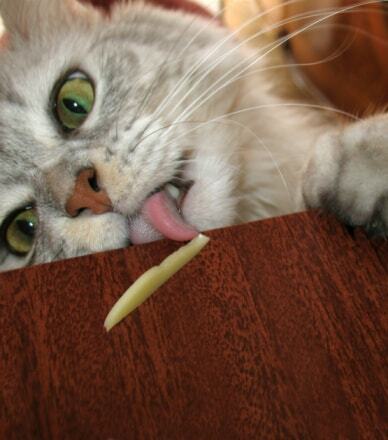 Cheese is feline-friendly, in small amounts. Remember up above when we mentioned that some cats are lactose intolerant? Cheese is dairy, so proceed with caution. If your cat can handle it without an upset stomach, cheese can be a tasty treat. Stick with hard cheeses like cheddar, Swiss, or Gouda that are high in calcium and protein and always treat in moderation. What other ‘people foods’ does your cat enjoy as an occasional treat? Let us know! And if you found this article helpful, pin it! Myn 13 yr. old Bombay loves people food but really loves the tips of the leaves on fresh pineapples, the little green tip of leaf on an ear of corn, donuts, cookies, marinara sauce and chili!